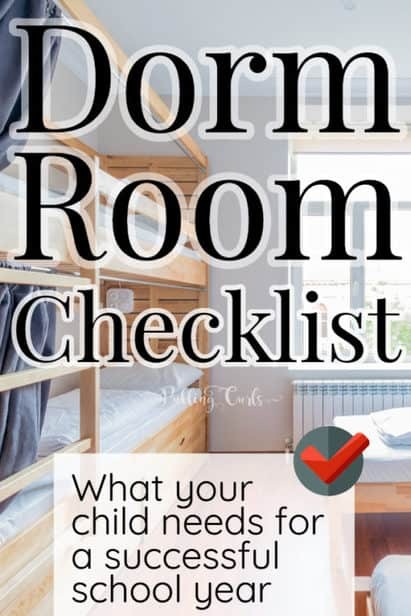 This dorm room checklist gifts you a list of necessities for college-bound freshman students. 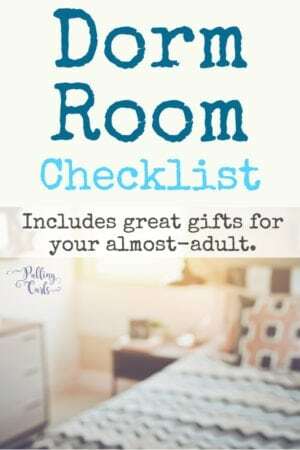 I will even give you a PDF printable checklist to mark off as you go. Filling your dorm room is the STUDENT’S job. We decided to give a lot of presents for my son’s 18th birthday that would help him adult (things he probably wouldn’t have thought of himself) — but be sure that THEY are the main ones getting these items together. Remember, now is the time to BE an adult! My friend Katie has a great post on gift ideas for college students. Once you find out these things, you can start to fill in gaps. 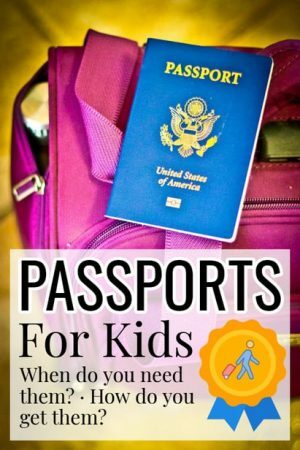 Btw, my friend Katie has a great post on Christmas ideas for college students, you might like as well! Bedding (sheets, comforter, pillowcases) — be SURE to check the length of the bed (most seem to have Twin XL) — these sheets are a great option, I love the reviews & the price tag! Pillow — again, these have great reviews & price. 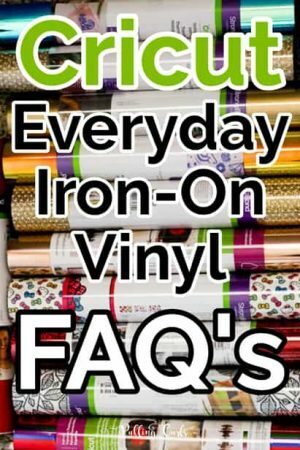 A lot of these are AWESOME to get at the dollar store, you may even have some of it around the house you can corral together cheaper — I’m sharing links to show you awesome products or what I’m talking about in some cases. Nail clippers — the reviews for this set made me want to get them. Razor — this set gets great reviews, and I love these to prevent nicks — but something like Dollar Shave Club might be a good investment to be sent to the dorm. Tweezers — this seems to be the brand everyone loves! Makeup/beauty/hair products (I would suggest limiting these as much as possible…. Unless it’s medication they take frequently, I would recommend getting bottles/pill packs at the dollar store. The bottles aren’t big, but can be helpful if they are stuck and need some meds asap. Microwaveable bowl — we got this kind because my kid loves ramen and soup. Cooks in the microwave and you can still have a cool bowl to hold. Mr Clean Magic Eraser — gotta love ’em! Cleaning Supplies — because I’m not sure how much of a priority cleaning will be I just got him some of these. Small broom/dust bin — this one is sized perfectly! Screwdriver — one with a few different heads is awfully handy! Chopsticks/utensils — yup, because chopsticks are easier to clean…. Sewing Kit — I have zero idea if this will get used — but this one even comes with an emergency helper book. Dish Towels — they don’t need a ton of them, but these can be used for several things — spills, hot items out of the microwave, etc. Flashlight — there’s likely to be at least one power outage…. or a sock behind a bed…. these look pretty handy! Dishes/silverware — find these cheaply at Target, or Amazon has these that look great! Clock — I have an Amazon Alexa in one of these — and I love it. Oh, and just in case your freshman has a new car — don’t miss the car lover’s gift guide! Binder clips (can be helpful for lots of things) — Amazon has a cool set of all these types of things. Power Strip — I’d get one that has some USB power options as well. And, my Freshman son’s favorite gift…. a $50 Costco Cash card. Whether it’s food, or being able to walk in and get a hot dog — since he won’t have his own membership, he’s pretty thrilled (holders of a Costco Cash Card don’t need a membership to purchase at the store). All those freshman necessities in one spot — free with sign-up to my newsletter! If you liked this post, you might be struggling with your almost adult too — be sure to check out my practical parenting series and check out my other parenting posts below that.